On the A55 highway take the Carry exit. After 1 km, turn right towards ENSUES. Pass the village and turn right towards " les Calanques". 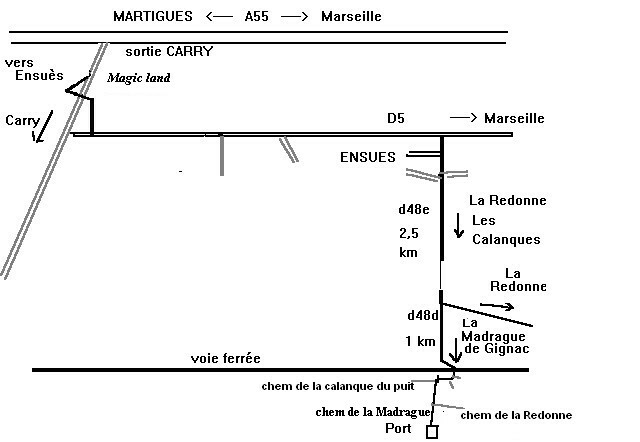 After 3 km, turn right to LA MADRAGUE DE GIGNAC on a deep slope down to the harbour. You'll see a big one -storey house, with two palm trees and the sign of "gîtes de France". We live 50 m higher : 5 chemin de la calanque du puit.